All homes currently listed for sale in the zip code 78254 as of 04/20/2019 are shown below. You can change the search criteria at any time by pressing the 'Change Search' button below. "Beautiful colonial on 1.36 acres, 5 BR 3.5 baths-3 car garage a 1540 SQFT wrap-around deck & added landscaping for privacy. Open floor plan for Entertaining w/ double staircase, formal dining, dual-sided FP, custom bookshelves & two masters. Wonderful kitchen featuring granite counter tops, island & huge pantry. Secluded master down w/outside access. Solar Panel package that makes your electric bill miniscule for this sqft! TWO NEW TRANE AC units, flooring upgrades and masterful floor plan you"
"Two-story entry with a circular staircase. Library with French doors. Formal dining room. Two-story open family room with a wall of windows. Kitchen and morning area open to family room. Master bedroom with 12-foot ceiling. Master bath with dual vanities, garden tub, a separate enclosed glass shower and a walk-in closet. Secondary bedrooms, game room and media room completed the second level. Mud room off 3-car garage." "Library with French doors frames the entry. Guest suite with a walk-in closet and a full bath. Media room with French doors. Kitchen features a large pantry and a large island with built-in seating space. Family room with a wall of windows. Master suite with 12-foot coffered ceilings. Double doors lead to master bath with separate vanities, a garden tub, separate glass-enclosed shower, and two walk-in closets. Covered backyard patio. Mud room leads to 3-car garage." "Entry and extended entry with 12-foot ceiling. Family room with ceramic tile floor features a wall of windows. Kitchen features an island with built-in seating space and walk-in pantry. Dining area with walls of windows. Secluded master suite. Master bath with double door entry features dual vanities, garden tub, separate glass-enclosed shower and two walk-in closets. Game room. Mud room. Extended covered backyard patio. Three-car garage." "HIGH CEILING, EXTENDED PATIO, BEAUTIFUL LARGE OPEN KITCHEN, QUARTZ SLAB KITCHEN COUNTER TOPS, PREWIRED THEATER ROOM"
"Library off the main entry with French doors. Game room with French doors. Kitchen features an island with built-in seating space and a corner pantry. Family room opens to the kitchen with three large windows. Master bedroom has three large windows and leads to the master bath with double doors. Master bath features dual sinks, a large garden tub, a separate glass-enclosed shower and an oversized walk-in closet. Guest suite features a full bath and walk-in closet. Two-car garage." "This unique floor plan features a grand entrance with a beautiful outside courtyard. 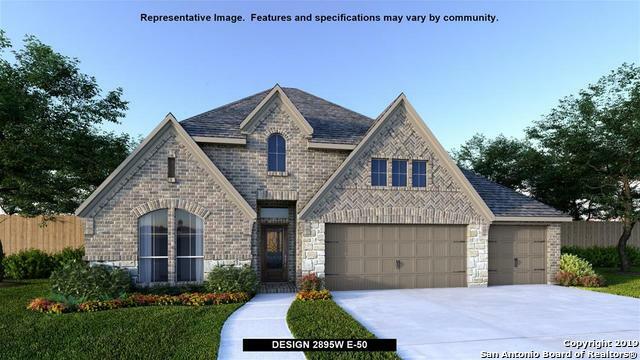 Once in the home, you will be delighted by the massive family room with lots of windows, adjoining dining room, and an open, gourmet kitchen complete with granite countertops and stainless steel, built-in appliances. The 4th bedroom is a perfect in-law suite with its own full bath and walk-in closet. The home has a separate mud room, as well as an oversized laundry room with space for an additional refrigerator." "Former model! Beautiful single story four bedroom three full bath. This home has it all!" 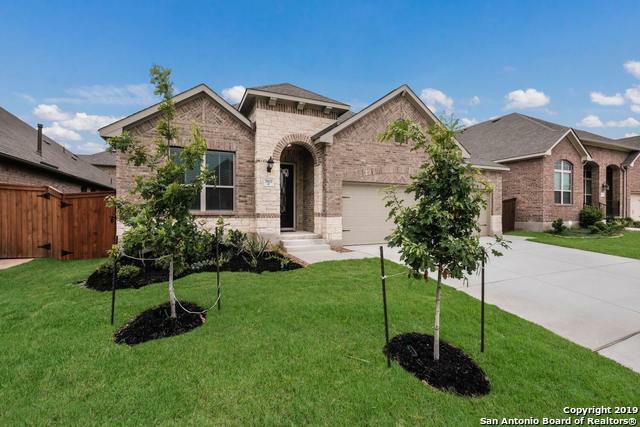 "Former model home available now as-is! 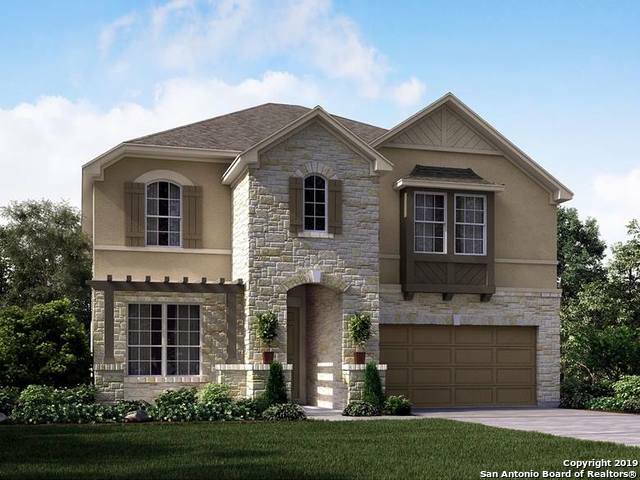 Work from home in the Glen Rose's private main floor study before enjoying happy hour outside under the covered patio. Located within award winning Northside Independent School District, near shopping centers and places of recreation. Known for their energy-efficient features, our homes help you live a healthier and quieter lifestyle while saving thousands of dollars on utility bills." 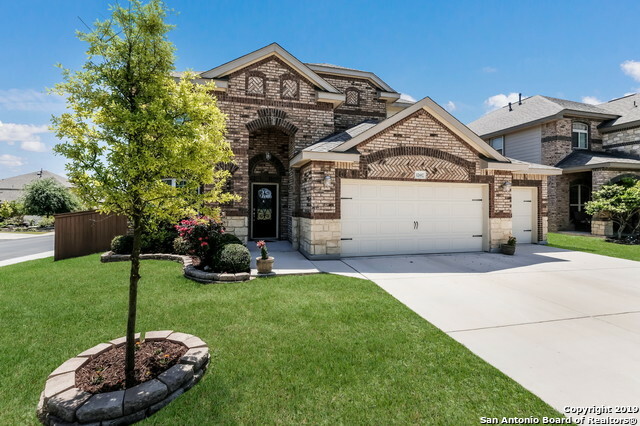 "Beautiful One Story Home**Corner Lot**2 Living Areas**4Bedrooms**Texas Size Master W/Big Seating Area/Gym**Open Floor Plan**High Ceilings**Great In Ground Pool**Large Cover Patio**Shed**Fenced Dog Run**Side Entry Garage**Must See**Gated Community**Go To 3D Tour to See Floor Plan**"
"Don't miss out on this better than new home in the desirable community of Stillwater Ranch. 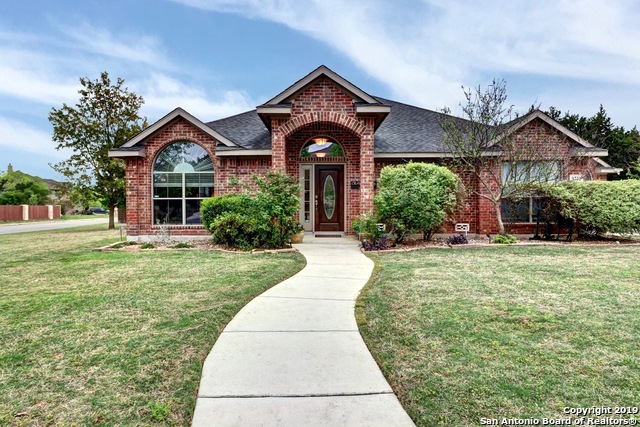 Gorgeous setting, nestled in a cul-de-sac w/ mature oak trees and located on .34 greenbelt lot. Beautiful high-ceiling open floor plan, granite counter tops an abundance of cooking space, rev osmosis & water softener. From the 8' entry door to the stone fireplace & vaulted ceiling family room, only further enhance the beauty of this home. 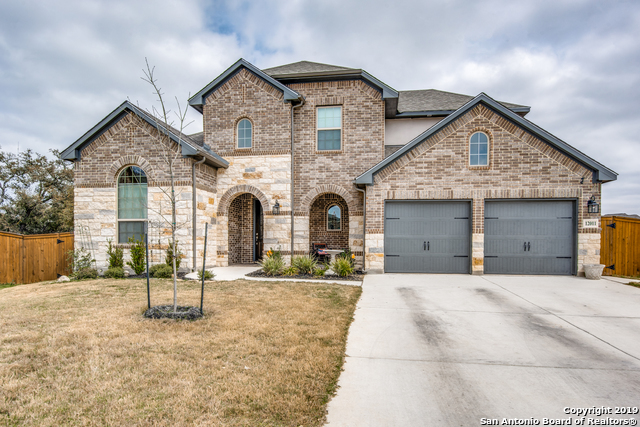 Relax on the extended patio & invite your family and friends to pur"
"Gorgeous home on a premium lot, cul-de-sac, greenbelt, extended covered patio with deck, and even a pond!! 5 bedrooms and an office so there is plenty of room for everyone. Office could also be used as a 6th bedroom. Come see all the upgrades like sliding barn door and reclaimed wood wall. Don't forget about the Ring doorbell. 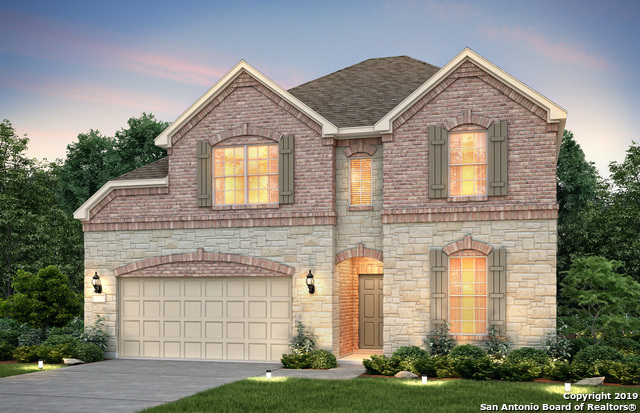 All of this just MINUTES from shopping and dining in Alamo Ranch. **** Seller would like to lease back until June 15th***"
"The Lexington boasts a two-story foyer with scenic views and three windows spanning the great room, plus a spacious second floor media room. Other features include beautiful granite kitchen countertops, dramatic entry open to second story, enormous island in pro style kitchen, his & hers closets in master bedroom, and covered back patio. Home includes the backbone for the Pulte Smart Home. Please contact onsite sales counselor for more details." 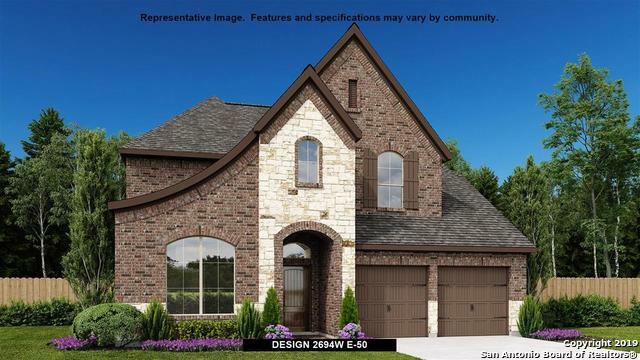 "MLS# 1371951 - Built by Highland Homes - June completion! 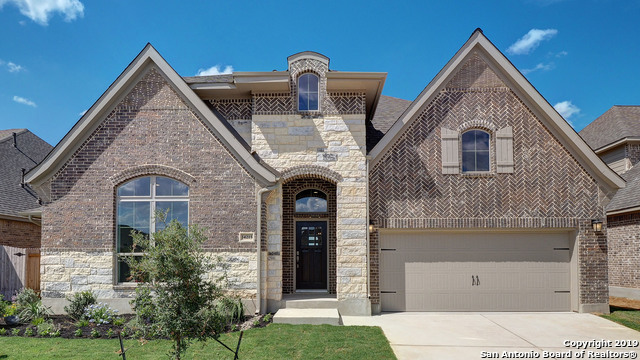 ~ Gorgeous 2 story home with soaring ceilings and tall windows. Charming kitchen with 42 inch cabinets, granite countertops, & stainless steel appliances. Secondary bedroom and full bath downstairs. Master suite features extended bay window, garden tub, walk-in shower and closet. 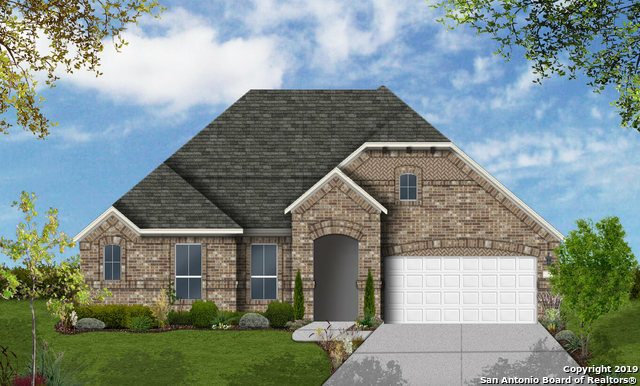 Upstairs features 3 bedrooms, 2 full bathrooms, gameroom, and play room." 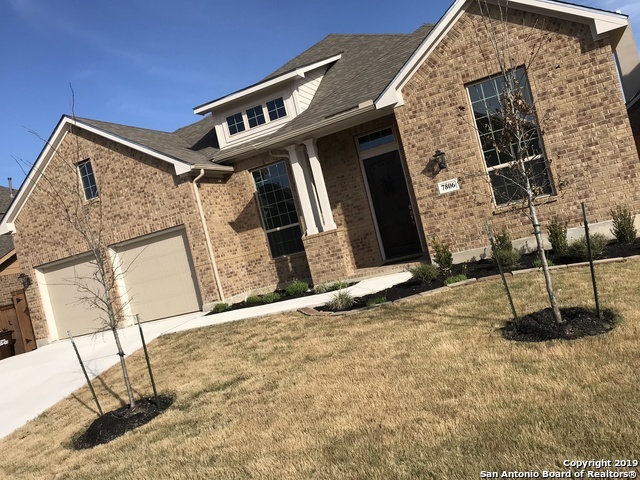 "Brand NEW energy-efficient home ready June 2019! Dual walk-in closets and sinks in the Redwood's main level owner's suite help busy mornings. All bedrooms boasts a walk-in closet and the huge game and media rooms offer endless fun. Prescott Oaks is located just west of Loop 1604 on Galm Road in the award winning Northside Independent School District. 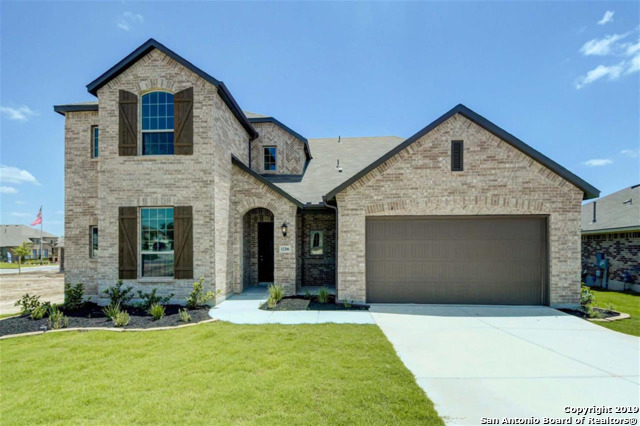 Known for their energy-efficient features, our homes help you live a healthier and quieter lifestyle while saving thousands of dollars on utilities"
"New Jeffrey Harrison Home Ready to Move-In. 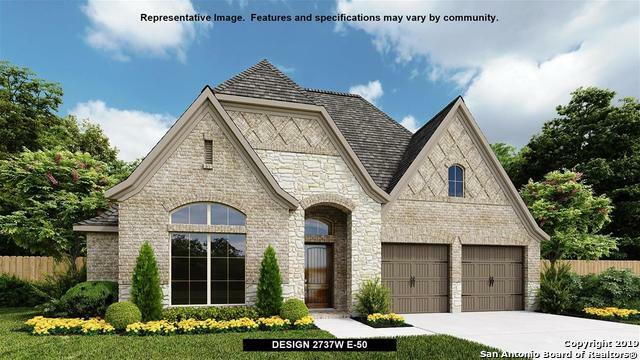 Beautiful 2 story plan with 4 bedrooms and 3 1/2 baths, study and game room. All stainless steel built in appliances, 4 burner gas cooktop. Extended covered patio. Oversized 2 car garage, ceramic tile throughout first floor except master bedroom, upgraded front door, 5 1/4 baseboards, garage door opener, full landscape (all 4 sides) with irrigation system, ceiling fans at family, master and game room, granite @ kitchen and bath countertops,"
"AMAZING opportunity in Stillwater Ranch! 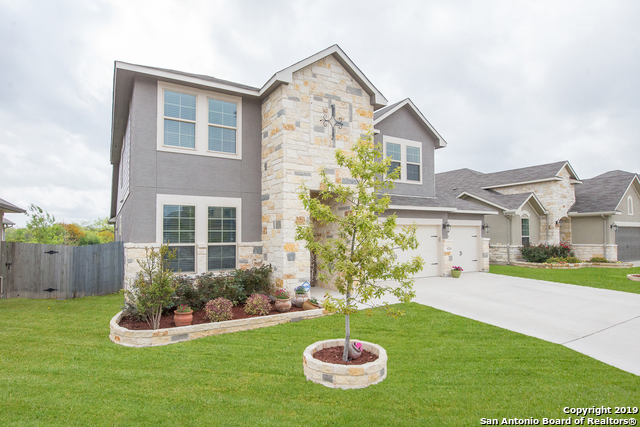 GORGEOUS one-story stone & stucco home built by Highland. Open floor plan with lots of natural light from the 8ft windows. study & media rooms as you enter the home. Dramatic foyer with 11ft ceiling, expanded master suite with spa-like bath. Why build if you can own this BEAUTIFUL home already fully upgraded, bamboo hardwood floors, custom made bookshelf in the office, crown molding throughout, water softener, Backs Up to Walking Trail-Greenbelt, this is "
"Former Model Home. Extended entry with 12-foot coffered ceiling. Library with French doors. Spacious family room with a wall of windows. Kitchen features an island with built-in seating space and a walk-in pantry that opens to the dining area and family room. Private master suite with a wall of windows. Master bath includes a corner garden tub, separate glass-enclosed shower, dual vanities, a linen closet and two large walk-in closets. Guest suite with a full bath and walk-in closet." "One-story design with 12-foot coffered ceilings in entry and extended entry. Spacious formal dining room. Library with French door entry. Open family room with ceramic tile floor flows into the kitchen and morning area. Kitchen features island with built-in seating space. Master suite with wall of windows in the bedroom. Garden tub, separate glass-enclosed shower, dual sinks and a large walk-in closet in the master bath. Guest suite. Game room with double doors. 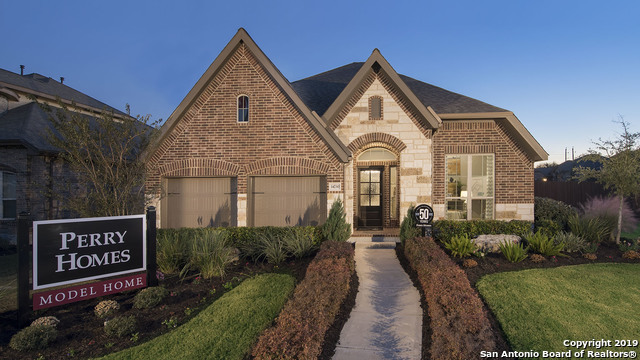 Mud room adjoins the oversized ut"
"Located in the prestigious community of Stillwater Ranch, you will find peace and serenity in a Hill Country setting. 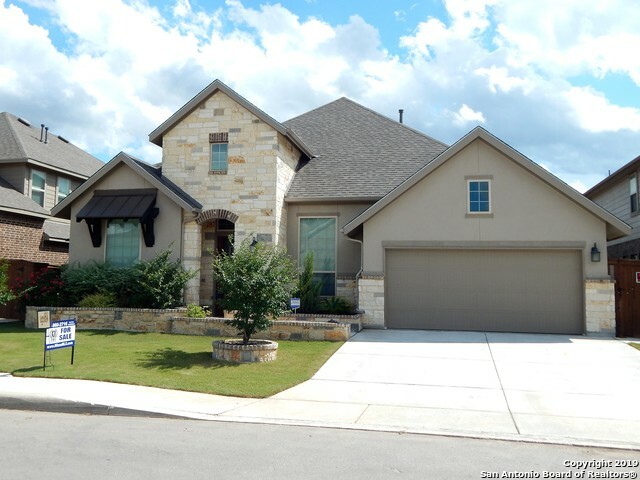 This beautiful 1-story home has 4 bedrooms plus a large game room/media room, 3 baths, and a 3-car garage. Eight-foot doors throughout the home give it a larger-than-life feel and the coffered celing in the family room adds the elegance that Coventry is known for! The eat-in kitchen with a large island has a butler's pantry and opens to the breakfast/dining room and family room." "Two story entry. Library with French doors. Kitchen features an island with built-in seating space and a large walk-in pantry. Dining area leads to the two story family room with a wall of windows. Private master suite with three large windows. Double doors lead to master bath with dual vanities, a separate glass enclosed shower and a large walk-in closet. Utility room leads to the two-car garage." "Beautiful 2 Story open floor plan, high ceilings, ceramic title downstairs. The crown molding, alcoves are beautiful. Kitchen has granite countertops. Bedrooms all have walk-in closets. Master suite has a sitting area leading into his & hers bathrooms and family shower. Darling Jack-Jill connects 2 bedrooms. Great features: Solar panels, pantry, water softner (owned), established landscape. Home sits adjacent to the park, pool and playground. Exemplary schools district." "This beautiful home includes: Separate Tub and Shower in Master, Granite Counter tops in Kitchen, 14X11 Covered Patio, 9 & 10 Ft Ceilings first floor, Radiant Barrier Roof Decking w/16 SEER AC System, 16 Tile on entire first floor except for Bedrooms and Study, Gas Stainless Steel Appliances (Excludes Refrigerator), Water Softener Loop, Irrigation System, Wood Shelving."